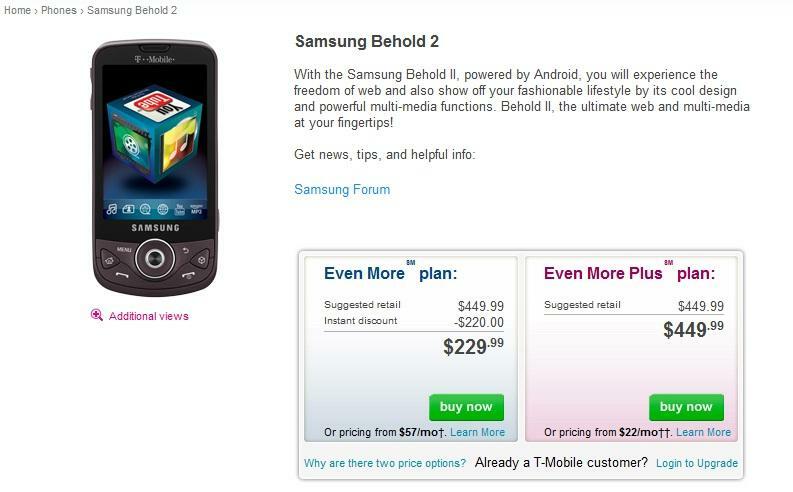 Today, T-Mobile has officially released the Samsung Behold II. T-Mobile’s third Android enabled phone this year, is just in time for the holidays! Featuring a nice vibrant AMOLED 3.2 inch touch screen, Samsung’s TouchWiz interface, a 528MHz processor, 200MB internal memory, and 320MB of RAM. Although we were expecting a $199.99 2-year commitment price tag, it looks as if T-Mobile had a last minute change of mind on the pricing. The Behold 2 is available for $229.99 with a 2-year contract, and will include a nice 2GB microSD card, a carrying case, and all the other standard junk helpful stuff that comes inside the box. Are you planning on picking up one of these bad boy’s? Leave your thoughts in the comments! For weeks, I was trying to analyze which phone to get: BB 9700 or Behold 2. I bought the Bold on Monday and have had a good 2 days to test it. It is very high quality. The keyboard is easy to type, the screen is bright and clear, the media and browers work just fine, and it’s fast. Reading some of the reviews about the quality and speed of the Behold 2, I’m glad I bought the 9700. I’m hearing words like sluggish, plasticy, cheesey. I plan to test the Behold 2 for myself this weekend, but if you are torn between these two phones, I would recommend the BB 9700 on quality of the hardware, speed and price ($30 cheaper if you are on contract). Thanks Jeff! Great insights – I’ve been torn myself…luv the Android OS, but double luv the BB hardware. Only thing possibly holding me back on the 9700 is the fact that it doesn’t support the new web BB will complete next year, I guess. go to that site and read about the Blackberry Dev Conference they had this year and all the shinanigans that is coming :D super excited!! @ Jeff – I am yet to even test out the Behold I, however, I am assuming this one is a major upgrade to its brother. I agree on going for the BB 9700, but that’s only because T-Mobile is yet to get its hands on some really high-end android powered phones. We are a little behind on devices, however, we were the first to jump-start the BB 9700. I hear AT&T is already selling to its business customers and then on the 22nd of this month goes public. or any damn thing with Android AND UMA. Boooooring!!!!! $229 for this? Not even the droid or the hero! Looks like you can pick the phone up for $199 if you’re a TMO customer if you log into the TMO website. Same old processor… meh. 200mb of available ROM and 320mb of RAM? RAM sounds incorrect, though I may be wrong. Crappy interface… no keyboard, only 2gb SD card, and it’s still $30 more than the Droid?! WTF is T-Mobile doing?! I’ve been off contract since January and am hanging around till next February/March. If T-Mo doesn’t release a real 2nd gen Android phone, I’m leaving without regrets. It looks like the upgrade price is 199. 230 is for new customers only. But with T_mo you never know. I was in a similar spot as Jeff. Bought the 9700 on Monday. Exchanged it for the Behold II today. I wasn’t a fan of the BB. Keep in mind, I was coming from a G1, with no prior BB experience. I was spoiled by the ease of use of the G1. And if you liked the G1, you’ll be very happy with the Behold II. Based on my very limited 2 days of use of the 9700, the Behold II seems much more user-friendly, and the web browsing experience is approximately 139.7% awesomer. I’ve come to accept the fact that my simple brain cannot handle the power & functionality the 9700 allegedly has. So I’m w/ Android all the way. That being said, the 9700 is one slick device. Felt good in the hand (that’s what she said), and it was compact yet still easy to type with. went to check out the behold 2, the hot eastern european lady in front of me bought one (we were the only two people in the store), The Tmobile girl kept on pushing the myTouch and said the behold falls short of the touch unless your looking for a camera phone with flash and android. my impressions of the behold were not good. the menu scrolled slow, the cube was slow. the screen was AWESOME. the worst thing was when moving the d-pad thingy all the buttons moved around i thought the cube button would pop out. so question for you tmo android fans why would someone even buy this at 229 over the myTouch? i understand the camera thing is better, and the more ram for apps. but dont understand the same processor and beholds UI that slowsssssss things down? I’m debating the same thing. If it’s the same processor and all you get is the RAM increase, why not get the MyTouch? Root and mod a MyTouch and you’re probably leaps ahead of how the Behold is doing. Anyone else have thoughts from handling both of them? Build quality comparison? i played with it for 20min and i liked it. because the phone is a bit wider than the mytouch it really looks as if the screen is bigger and that oled screen was gorgeous. i really didnt think that it was slow at all i think it has more to do with the cube animation used when the screens transition but i didnt have enough time to change it in the settings i was to busy playing with the camera and video player, this alone had me wanting the phone i could take a picture and focus and zoom. i also tested the keyboard out and thought it was better than stock keyboard on mt3g. All in all this thing rooted and moded would make a good phone. Especially now that i found out what SE wants for the X10. Why? If it can be rooted then there are several reasons. 1) 3.5mm jack, better camera, led flash, AMOLED screen, and possibly more ram. Thank god Tmo has pushed out its last average phone that we know about. Time for them leaks to start popping up about which phones are next! Maybe this time around we will see something with better specs than a G1. I’m probably overreacting – but there’s no LED indicator light on the Behold II when a new message comes in. What’s up with that? Verizon does 528Mhz last gen Android devices for $99 and the Droid is $200. This thing has been getting slammed on all the majors gadget blogs. There’s no way the $200 for this matches the $200 for the Droid. Get me a modern Android device ASAP T-Mo. These 2008 phones are killing me, and your profit as well. More money and less phone than a Droid? No Android 2.0? Barely competes with the Eris/Hero and is 2x the price. I’ll probably get it because I’ve got a good plan with T-Mobile ($50 unlimited anytime) that I can’t seem to get matched anywhere else. However, this phone is a big fat FAIL for TMob. give me what i want or verizon droid with femtocell is in my future plus the 19% corporate discount i’ll get there. just hangin’ around ’til all the obligations are over. the behold does have UMA! also it is $199.99 for all upgrade eligible customers. and with touchwiz stripped out of it it run s faster than the droid, believe it or not. gotta love android whatever you don’t like in the ui can always be fixed! Are you sure? Did you actually use UMA WiFi calling on it or did you find that info somewhere? The T-Mobile site says it has WiFi but doesn’t mention UMA or WiFi calling.. The Blackberry says “Wi-Fi and Mobile Calling” and the Behold 2 does not. I think you have your answer there, but you can always call 611 for an authoritative answer. I bought the Behold II for $199 this morning. Upgraded my current phone. Not sure if that made a difference? Anyone else find it for $199? So far its a pretty good phone. Smooth and was faster than my buddies Palm. did anyone notice that its a PITA to turn on the phone? there is a button on the side that you have to press twice to unlock it. its not easy. on a positve it looks nice, unlike the Zak Morris 80’s phone verizon calls Droid. Droid’s screen is HUGE but it looks like what a terminator would drop after eating mexican food. Amen! lol CrackBerry.. baby is an addiction!!! btw, i gotta agree with “ByeMrTmobile” .. i hate how the droid looks. just go into google and type in droid, and go to the forums or blogs the fone is mentioned in, 1 out of 3 ppl are complaining about its many bugs, and that the camara BLOWS. luckily for them Verizon is releasing a major update on dec. 11 to fix all of them. but dont worry “mr.g” .. NEXT YEAR is when BlackBerrys will shine, when the new web browser comes out with full flash support from adobe and OS 5.0 is finally official and stable, and dont forget the OpenGL 3d graphics! Do u really believe that apple and google are going to let rim steal their momentum? Wow blackberries are finally getting a webkit browser. Big deal, u crackberry junkies always fall for new hardware even though the software is crap. How many battery pulls have u had to do already. I played with this POS tonight… No way is it worth $199.00 or even $99.00.. Maybe $79.00.. Too much plastic and the buttons are feel like loose teeth…. Sounds like my old samsung t809, you could squeeze it and get that plasticy creek. We’re moviing in the wrong direction here. After all the question of 2.0 support for the cliq killed my enthusiasm, I thought maybe I’ll pick up a G1 or myTouch to hold me over (until hell freezes over & a phone comes out without some fool screwing it up). $399? Still? I figured when the prices dropped, the base price drop, not the “discount” getting bigger. And now we have this. What the hell? Pricing reality check maybe? At this rate the next rehash will cost $500 and have a tad more ram. Also, a gimmicky cube is something I’d expect from an OS demo, not a final product. I gotta go to the store to play with it, lol, but no matter how you look at it, its still a Sammy, thou it has a nice OLED screen thou im sure. I played with this device for 45 minutes at Tmo. I was very anxious to try and was hoping to really like it. Unfortunately I thought it was a real disappointment. The time to load and transition between pictures is terrible. I had the camera application crash on me. The overall experience was bad. It’s not a terrible phone, but something worth passing on. I bought the behold 2 today. I was a die hard blackberry fan. My company switched from BES to active sync. I am adjusting to the new phone. The virtual keyboard has taken some time to adjust, but I am getting the hang of it quickly. I like the way the phone has a slight vibration when I type. I am starting to really like this phone. Nothing is perfect, but there are all these extra features BB doesn’t offer. I mainly use my phone for buisness and think this phone will work just fine. I was concerned due to all the negative info. The major issue for me is the price. I will update in a few days after I have more time with the phone. I bought mine today….i love it…. The behold 2 its a great upgrade from my G1, it doesnt have the lag to the home screen like the G1 and MYTouch, may be cuz of the increased RAM, fells well built, and the 3.5mm jack make a big difference. Just think, I’ve had the same thing y’all are fighting over for 12 months now. LOL. G1 all the way baby! G – 1 – could – go – all – way!!! I bought one of these for my wife and I have a few things too say about it. I have used a G1 since day one and have rooted and installed every build of hero and other custom roms, so I have some experience playing with android. First, the screen is great, amazing black levels and very vibrant colors. Second, and something I have yet to hear anyone else mention, the phone is themed mostly black. From the keyboard to the messaging app, black background everywhere, which i love. From a practical standpoint there is no comparison between this and any other traditional lcd screen. After using this phone for a few minutes and then going back to a g1 is like going from inside to outdoors on a bright day. Those lcd screens are like flashlights compared to this. It is so much easier to stare at in the dark, and direct sunlight. Third, the interface is definitely too busy, but that can be fixed. Fourth, the cube at first i felt was entirely unnecessary, which it kinda is, but it is very useful to have button that takes you directly to your media apps. Fifth, I love the drop down menu. I has toggles for bluetooth, gps, wifi, and airplane mode all along the top row where it typically says t-mobile. This is a major convenience and far superior to even a desktop widget. The drop down bar also has a “recent apps” button that performs the same function that holding down the “home” button does. Sixth, the music app is way better than the stock, but I think the hero one is better still. And finally, the phone seems fast to me. I understand why some people feel its slow, cause it kinda is, but i think its more for effect than due to lag. I think the best improvement the UI could get would be getting rid of the useless buttons on the bottom of the screen and putting the launcher on the side. I also look forward to custom roms on this phone. This should run Hero perfectly, and maybe even better due to the increased ram. Very excited about phones future potential. Really disappointing. Who ever is saying the Droid is not as good or buggy etc is obviously just in denial in support of T-mo. I love T-mo so dont get me wrong but our Android devices are really behind times. Droid is WAY faster with the one exception of swiping left and right on the home screens…but I’ll take that high resolution issue any day as a trade for the instant gratification when you open and an app and dont have to wait on it to load. I am rooted on my mytouch just to try to get some kinda closeness to this higher end android device. Anyways enough of my rant, Samsung boo!! Behold 2 boo!! 528 processor…BOOO!!!!! And Blackberry users…really…business use on T-mobile or do you really like them as a personal device (rhetorical). I’ll go take a look ’cause the reviews have been kind of all over. $229 is a non-starter for me though. In fact that price point kind of surprises me, both because the BB9700 came in for less and because other carriers have equally (more?) capable devices for less. It’s like no one at the T-Mobile home world is even glancing at what was happening with their competitors. But I’ll have a look… But I’m really hoping that Apple will make an AWS iPhone when the contract with the Death Star runs out. In fact, I’d settle for an AWS dongle for my iPod Touch..
Looks like this thing has HSDPA 3.5 vs the Cliq with HSDPA 7. I’m going with the Cliq. I got my Behold II the other day and I just found out from Samsung that their PC Studio program does not work with the Behold II and they can’t tell me when it will. Is this weird? I cannot connect my phone to my computer and load music on it or take videos and pictures off of my phone and put them on my hard drive. Again I ask, is this weird? I havent tried the device yet, but what in the world is everyone thinking comparing a BB to a phone that runs android? thats like comparing web-tv to a computer! Blackberrys were awesome phones until real smart phones came out! browsing the internet on a blackberry after android is like eating nails! Playing games on a blackberry is like playing games on a atari, the graphics are worse than the atari. The phone might be a little dissapointing as far as the version of android and some of the specs (cpu for sure) but please dont put a blackberry in the same category as any phone running android! its not fair for the blackberry!